In the wilds of Ireland, that's how people speak. And in 1979 that's where I was, Well, wild-ish. People down in Kildare and the like will say. "Right, well I'll go - so." I love that. Or just "Right so." Unlike in Dublin were the kids all have that valley-girl twang in recent years, and everything sounds like a question? Anyway, this strip taps into that parental warning to never eat anything that's fallen on the floor. It must be why this just works so perfectly - on so many levels. 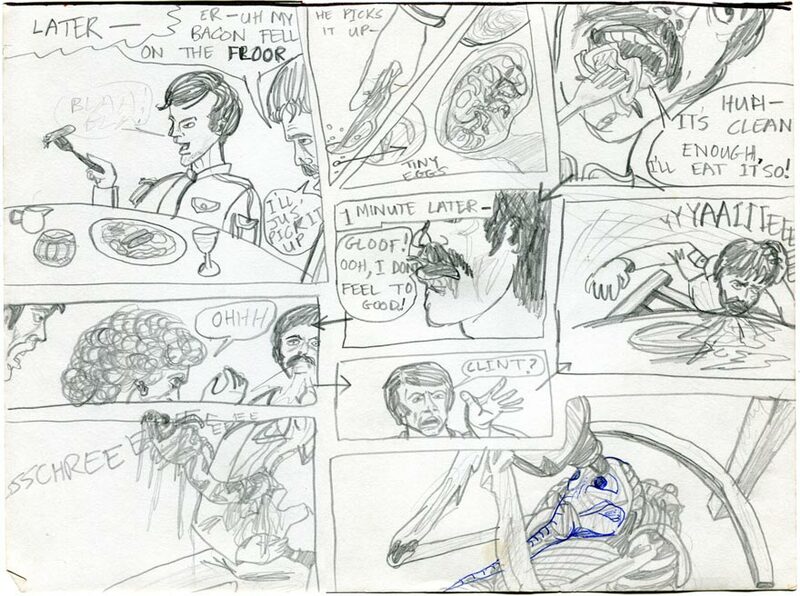 These pages were drawn after getting a few minutes' glance over my late uncle's copy of HR Giger's ALIEN design book. It seems that it was for sale at the cinema when he went to see Ridley Scott's version of ALIEN age 11 in Northern Ireland in 1979. Somehow I recalled the conning tower of the Norstomo(s) and the latterly named Space Jockey of the final panel above. I was fascinated by that book. Even my difficult to impress dad was - impressed. I suppose he'd never seen anything like it. I sure as hell never had - but I wanted to again. But you know what? This is pretty horrid stuff for an 11 year old to be drawing. To be honest.